Hello friends, At present time most of the mobile manufacturer companies launch budgeted smartphone which comes with different great features and latest technology. Now, Motorola company launched his latest Smartphone with the name of Moto G. Moto G smartphone is comes with 4.5-inch IPS LCD capacitive touchscreen with 16M colors which provide 720 x 1280 pixels and the density is 326ppi pixels with special Corning Gorilla Glass 3 protection. The Moto G smartphone is coupled with 8GB RAM and 16GB Storage Variant. Now this smarphone is available in the Indian market at Rs. 12,400 only. 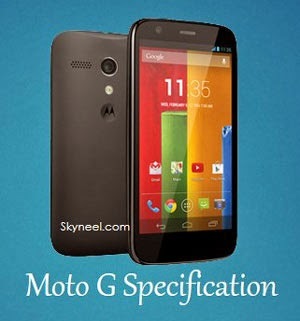 Moto G Has 4.5 inches IPS LCD capacitive touchscreen with resolution 720×1280 pixels. Motorola Moto G powered by a quad-core 1.2 GHz Cortex-A7 processor. It has a powerful processor which comes in lots of mobile now days. It has Qualcomm Snapdragon 400 chipset and comes with Adreno 305 GPU. This smartphone is coupled with 1GB RAM and 8GB/ 16GB Internal Storage capacity. Moto G comes with 4.5 inches IPS LCD capacitive touchscreen with 720×1280 pixels Resolution. It has 5 MP Rear Camera with 2592 х 1944 pixels, Auto-focus, LED flash and Geo-tagging, touch focus, face detection, HDR, panorama, 720p@30fps, stereo sound rec., HDR features along with 1.3MP Front Facing camera. Moto G is a stylish phone, it has 129.9 x 65.9 x 11.6 mm dimensions and phone weight is 143g. Motorola Moto G runs on android 4.3 jelly bean and Upgrade to v4.4.2 (KitKat). The Smartphone has a Accelerometer, proximity and Maps, Calendar, Google Search, Gmail, YouTube, Google Talk, Alarm, Calculator, Clock, and other Google sync apps. This is power pack with loaded lots of features and apps. Moto G has 2G and 3G network in GSM or CDMA both type of Smartphone. It has Wi-Fi 802.11 b/g/n, hotspot, Bluetooth v4.0, A2DP, LE, GPRS and EGPRS or EDGE, GLONASS, FM Radio, microUSB v2.0, USB Host. This smartphone comes with 2070mAh non-removable Li-Ion battery which provide talktime up to 24hrs. 3. It runs on latest Android version and upgradable to 4.4 KitKat. 1. Low and non-removable battery. 2. Memory can’t be expendable.